Posted in Food Safety and Nutrition	| Tagged California Mediterranean Diet, garlic in Mediterranean diet, Healthy Eating Plan, Mediterranean diet in America, What to eat on Mediterranean Diet	| Enter your password to view comments. Posted in Heirloom foods, Recipes	| Tagged how to make olives, lye cured olives, making olives	| Enter your password to view comments. It has been awhile since I updated this blog, and I feel I owe my readers an explanation. In addition to working as a Registered Dietitian, I am also a farmer. My guess is you have realized by now that we raise much of our own fruits and vegetables, and my goal on this site is to share with you some of the things I have learned while growing and harvesting and cooking my own food over the years. However, we actually also make money at farming, certainly not a lot, but enough to make it more than a hobby. There is one crop that “pays the bills” around this place, and that is the Satsuma Mandarin crop. Our Owari Satsuma Mandarins are a source of pride for Adrian and myself. They are the focus of our farming efforts throughout the year, and this time of year the Satsumas take over our lives. 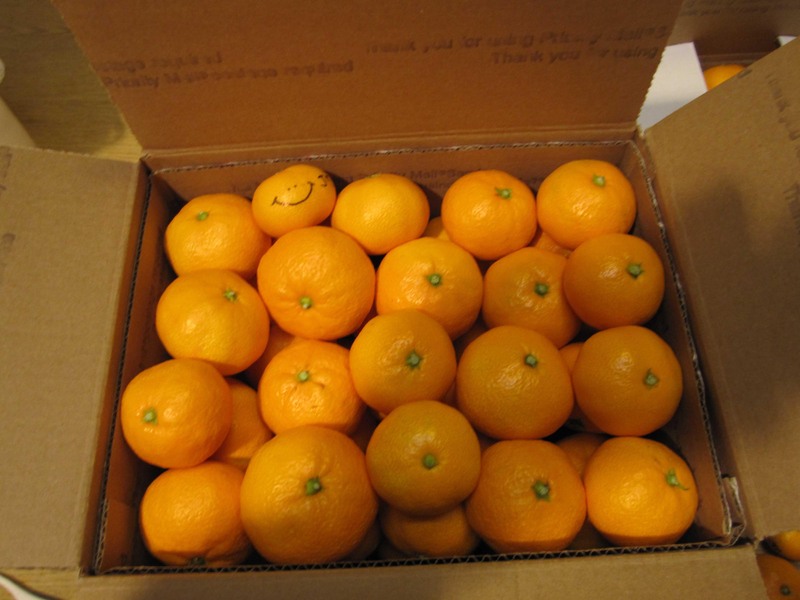 In a short period of time between December and January we pack and ship hundreds of boxes of Satsumas throughout the United States. We also sell them locally to our faithful customers who come back year after year for their holiday and New Years treats. They come back to our farm every year because they know they can count on us to sell them the very sweetest, most delicious mandarins we can possibly grow. This year the harvest was late, but the mandarins are finally absolutely delicious, and we will sell no mandarin before it’s time! When the Owari Satsuma Mandarin trees are fully loaded with a ripe crop, it is sometimes amazing how much fruit a little tree can hold. It is not uncommon to get up to 300 pounds of fruit from one tree. However, other trees may be taking a year off and have no fruit at all! Adrian and I usually pick all of the fruit ourselves because we are so particular about which fruit we will pick. We test a sample fruit from each tree with a refractometer, which is a tool that measures the sugar content of the fruit, and will not pick the the tree until the sample fruit reaches an acceptable amount of sugar (at least 11 percent and usually 12-14 percent). We also will taste the fruit and make sure it tastes sweet to us. Finally we examine every fruit to make sure it has no obvious green tinge to the skin, and then clip each fruit by hand and place it in the picking bag. Once we have picked the mandarins, we store them for a very brief period of time on trays while they are waiting to be packed. The trays have plenty of openings to allow good air circulation around the fruit. They are usually stored in a cool area such as the garage or our covered porch. Usually within 24 hours we carefully pack the Satsumas into bags or boxes. Again, we have no employees and do all of the work ourselves, to assure that our customers receive the highest quality product. Within 1-2 days the boxes or bags of mandarins are on their way to our customers in the mail or are waiting to be picked up. So..now you know where I have been the past few weeks. We are over 1/2 way finished with the harvest, and I will be back with more frequent posts once we finish. If you are interested in trying our delicious Satsuma Mandarins visit our web site www.burgesonfamilyfarm.com for more information on ordering. All content on this site is copyright protected. Reproduction of any content from this site without the written permission of the author is strictly prohibited. www.californiamediterranean.com © Dayna Green-Burgeson RD, CDE. All Rights Reserved. 2011-2015.